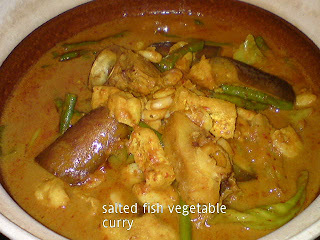 One of the popular Nyonya style curries with slightly different ingredients for the similar kind of curry. 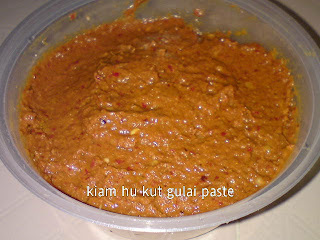 Some recipes do not add shrimp paste [belacan] to the spices. Very strong flavour, spicy curry with various vegetables. 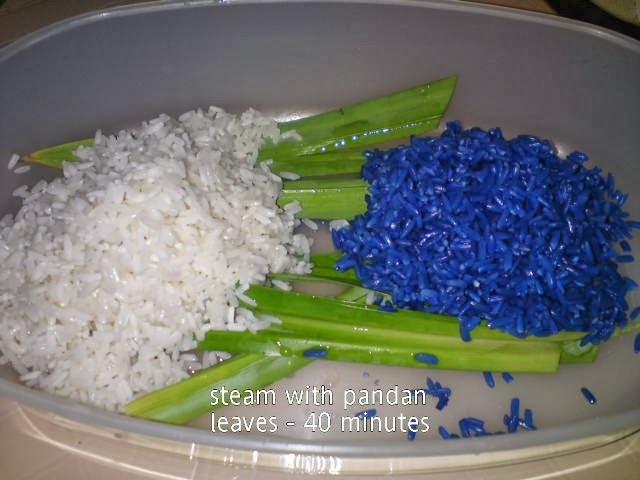 Good serving it with plain rice. 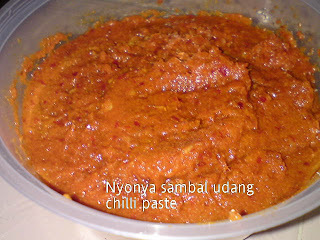 Sometimes, I love to spread the hot curry over blanched instant noodles. 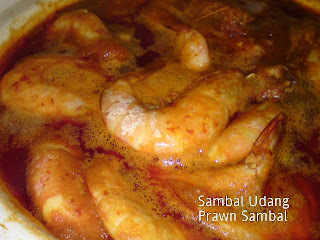 Wow!, reminds me of my working days in KL when my aunt used to prepare it for me. One point to note - taste before adding salt cos' the salted fish bones and some types of belacan or shrimp paste may be rather salty. 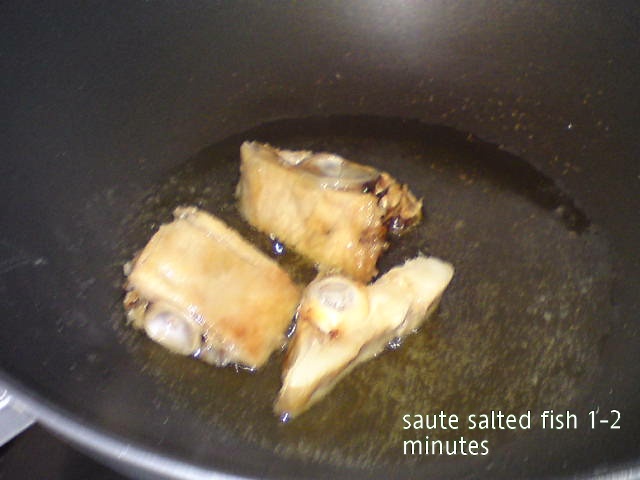 Heat oil in pan, saute salted fish bones for 1-2 minutes. Dish out. 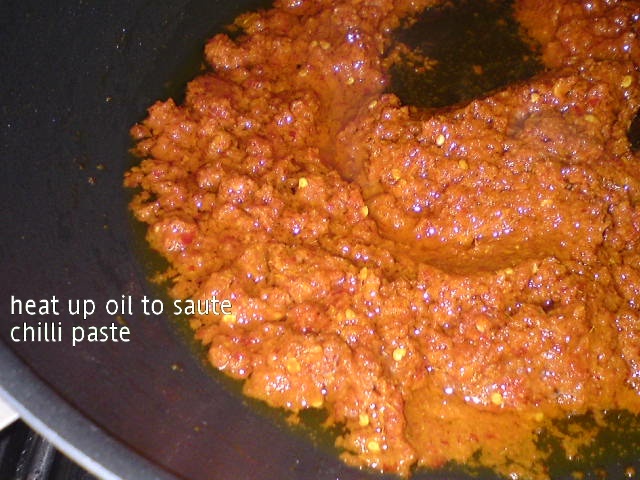 Using the same oil, add in curry paste. Fry until aromatic and oil separates. 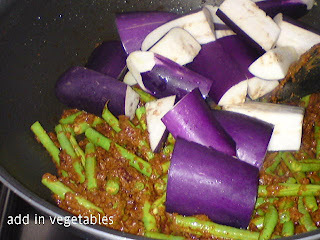 Add in long beans and brinjals. Stir fry to mix ingredients. Add in a little water for easier stirring of ingredients. 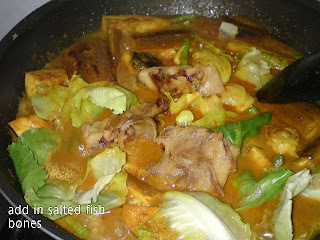 Add in cabbage leaves [if using] and fried salted fish bones. Stir fry for a minute. 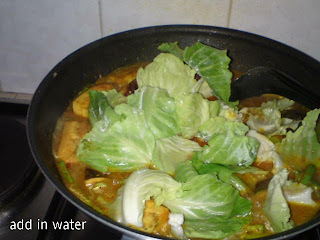 Add in remaining water, bring to boil. When vegetables have softened, add in the prawns and taufoo puffs. 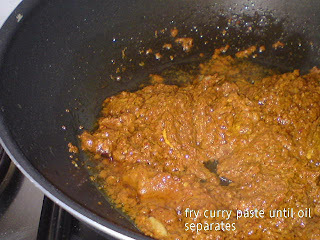 Let curry boils for another 1-2 minutes. 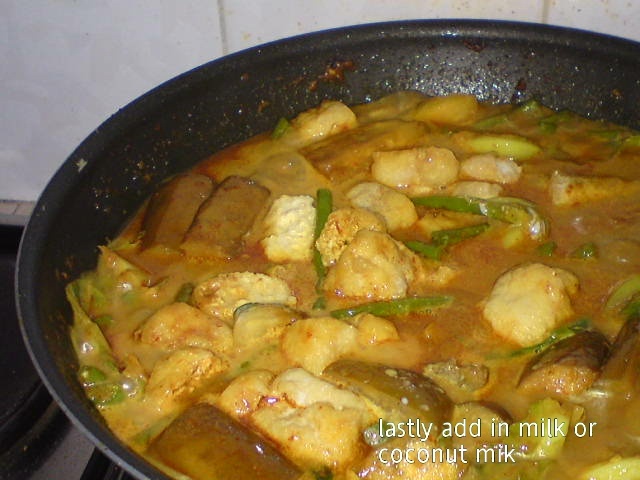 Add in seasoning to taste and lastly pour in coconut milk. Bring to boil again. 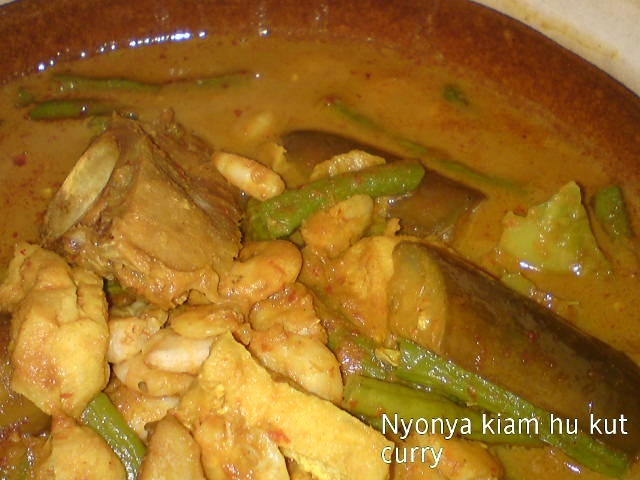 Off heat, serve curry with plain white rice. 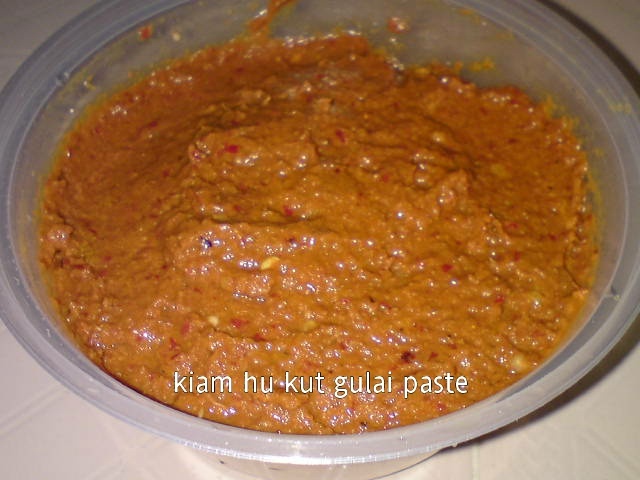 My mum used to cook this at home quite regularly but using ready bought fresh curry paste from the wet market. 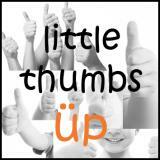 The taste varies each time. I came across this recipe from the book Nyonya Flavours where the curry paste is quite simple to prepare but rather spicy and tasty. So here is the recipe. The Sambal Udang was good with Nasi Lemak and freshly sliced cucumber. Hmmm..... yummy, yummy. yummy. You can use shelled small prawns for this dish. This was cooked at my MIL's place and I wasn't able to take better shots of the dish cos' we were all too busy enjoying this piping hot curry. Blend the spice paste ingredients in a processor until fine, then add tumeric powder. Mix well and set aside. 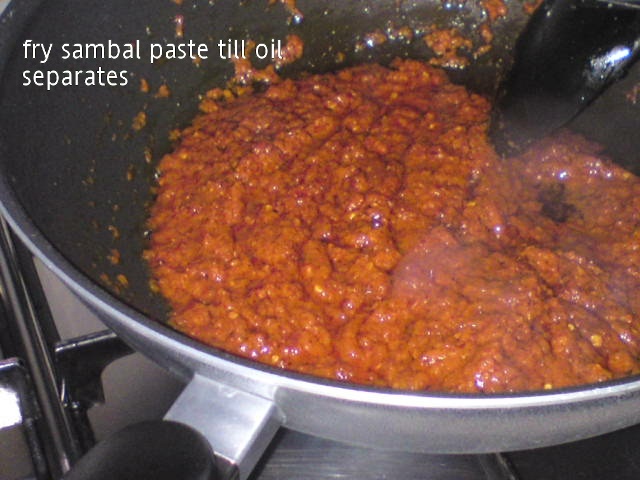 Dissolve tamarind pulp in water to extract the tamarind juice. 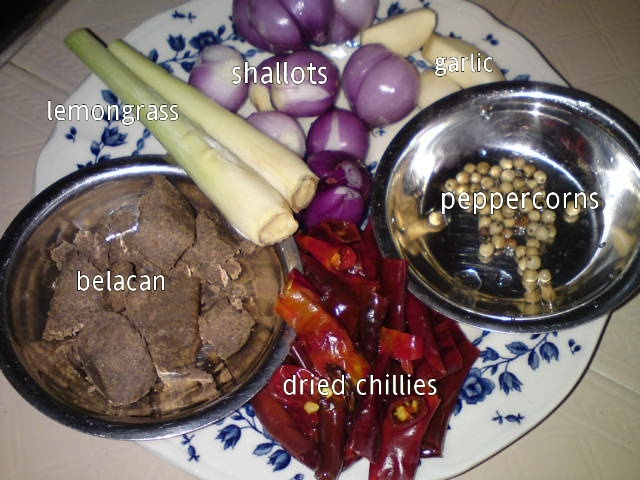 Strain and discard the tamarind seeds and pulp. Heat oil in wok, saute ground spice paste until aromatic and oil separates [can prepare paste until this stage and store in refrigerator until later use]. Add in the tamarind juice and seasoning. Bring to boil for several minutes, then add in the prawns. 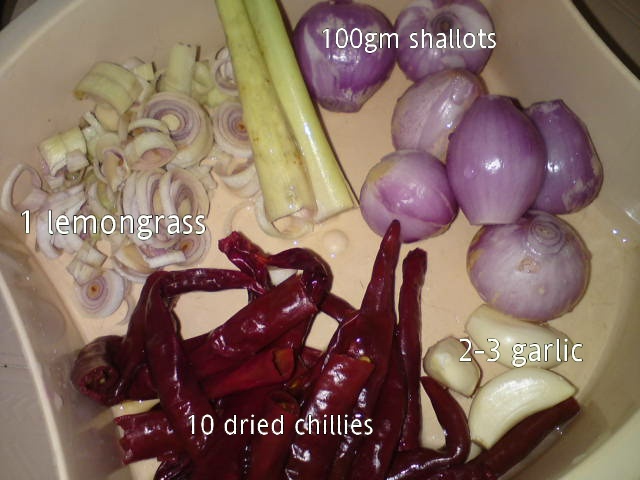 Continue to stir fry to coat prawns with curry paste. 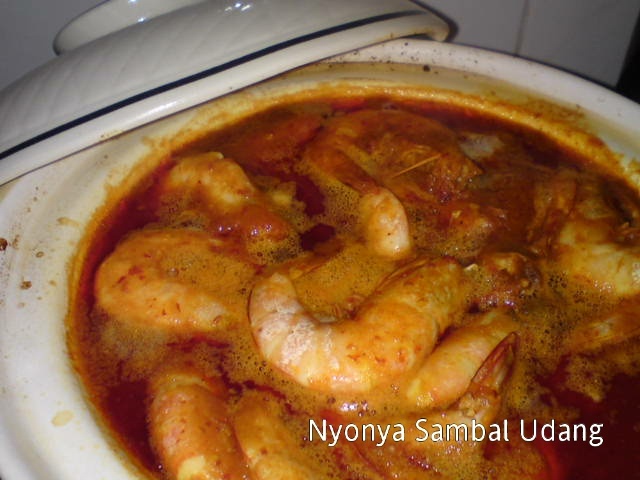 Taste to adjust seasoning and boil for a few minutes until prawns are cooked. 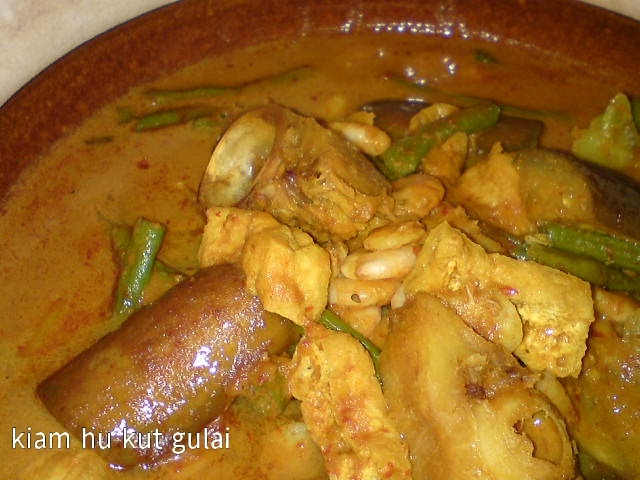 Dish out to serve with plain rice or nasi lemak. 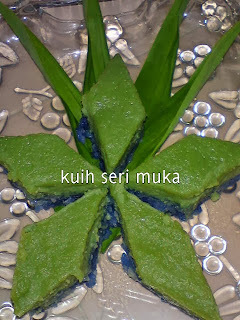 Torch ginger is a pink flower bud known to Malaysians as 'Bunga Kantan' and is a common herb in most Asian kitchens. It is a member of the ginger family. The bud when cut gives an invigorating aroma and is used to flavour tangy curries/soups [Gulai Tumis, Assam Laksa etc.] 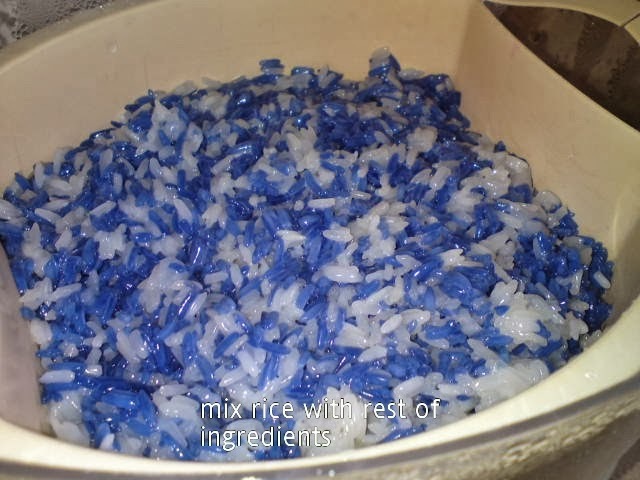 and rice [Nasi Ulam and Nasi Kerabu]. 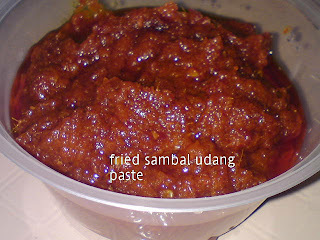 Here, it is use as an aromatic ingredient for a nice dipping sauce. A very easy, simple yet good dipping sauce for blanched meat fillet or steamed/boiled chicken meat. 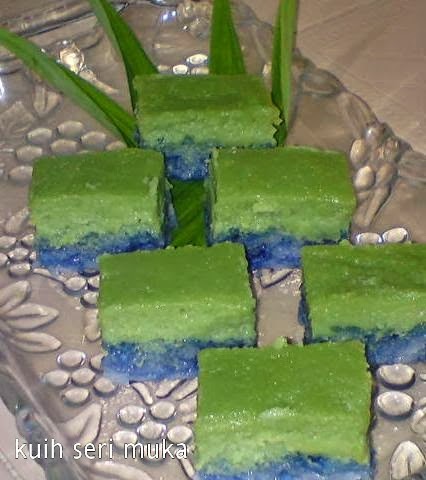 Savoury, sourish and sweet taste with fragrant aroma of chopped coriander leaves and the wild ginger flower [bunga kantan] is really appetising. 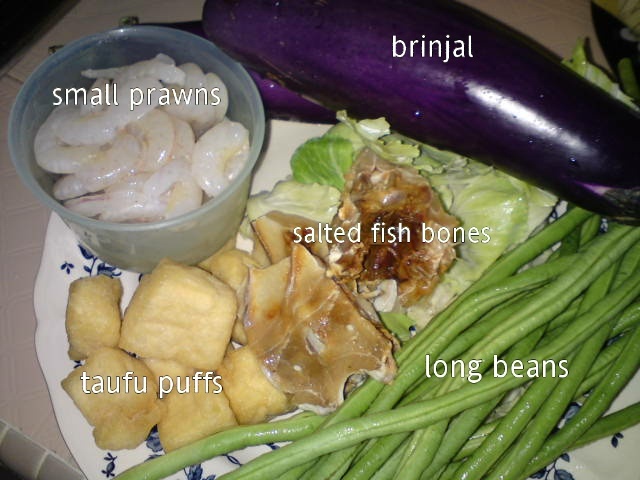 Prepare and mix all ingredients together. 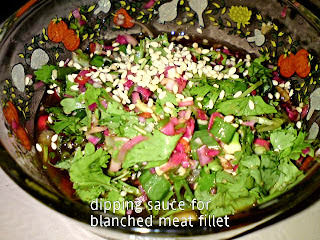 Serve with blanched thinly sliced meat fillets or steamed chicken - chopped. boil in boiling water for 5 minutes, off heat, cover and soak chicken for 15 minutes. Drain and brush with sesame oil. 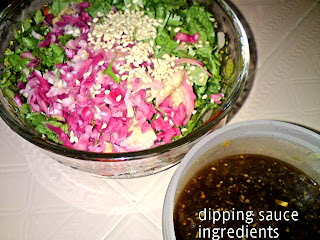 chopped into bite size pieces and serve with dipping sauce. 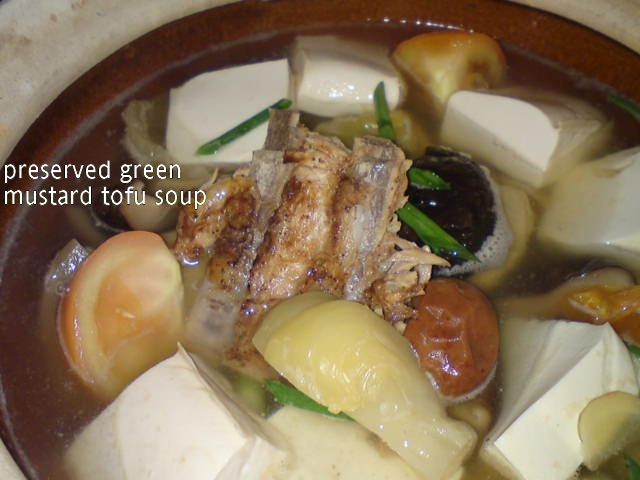 Came across this soup recipe in Agnes Chan's latest book 'Let's Eat'. I happened to have some roasted pork ribs from my mom and cooking this soup is a good way to clear them. Surprisingly the soup tastes very flavourful and appetising. 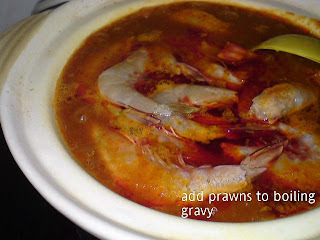 I think this soup is not new cos' some blogger friends have cooked this soup before. Since roasted pork ribs are quite oily, I suggest it is better to boil them with some water, drained and rinsed the ribs well before cooking with other ingredients. 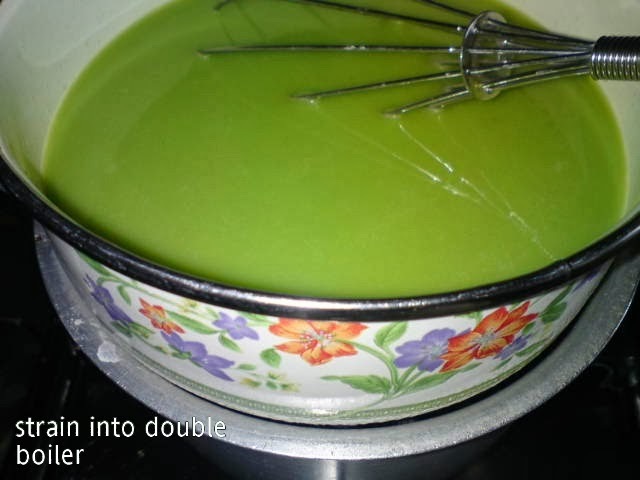 This way the soup will be clear and free of scums. Bring water to boil. Add in roasted pork ribs. 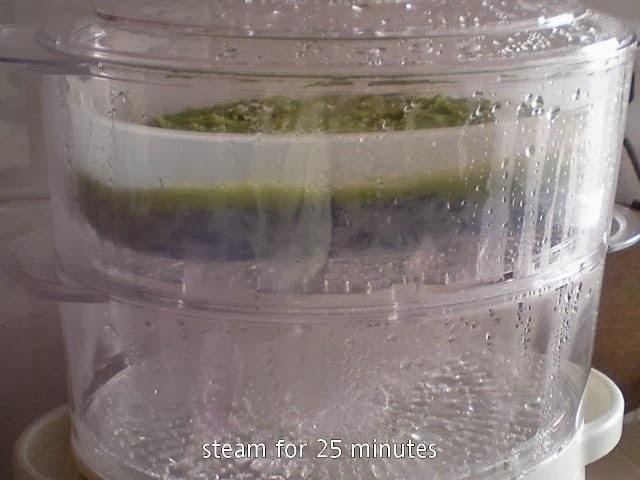 Boil for 1-2 minutes. Drained and rinse to clear off the scums. 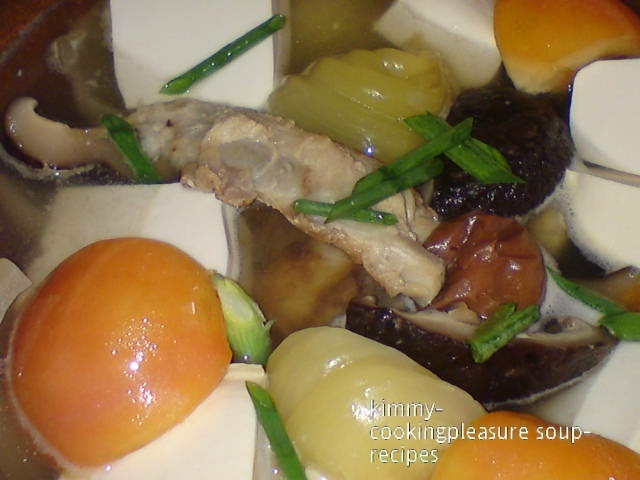 Place ginger, garlic, peppercorns and cleaned roasted pork ribs in a soup pot. Add water and bring it to a boil. 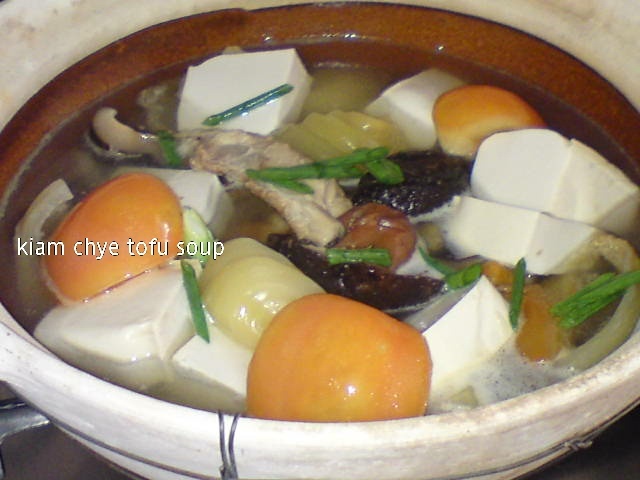 Lower heat to simmer until meat is tender [about 20 minutes] and soup is fragrant. 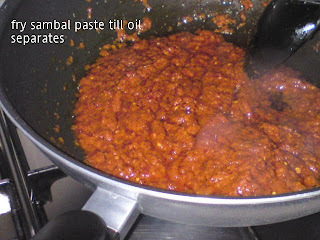 Add in preserved green mustard, tomatoes, wet plum and chicken meat [if using] . 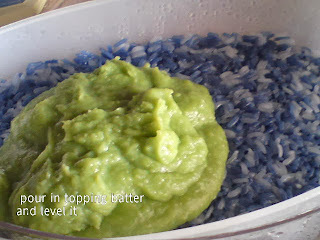 Boil for several minutes. 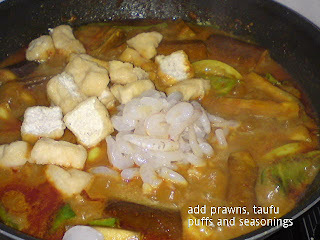 Lastly add in beancurd, wine and sesame oil. Add some salt and msg to taste. 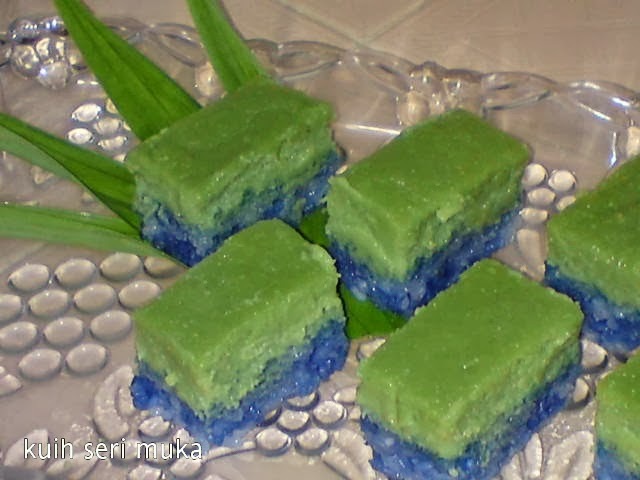 Garnish with cut spring onions and serve soup hot. Very happy with the 'performance' of my electric steamer, I made this steamed Nyonya kuih as I have the pandan juice and blue pea flower [bunga telang] water left over from making of the snowskin mooncakes. 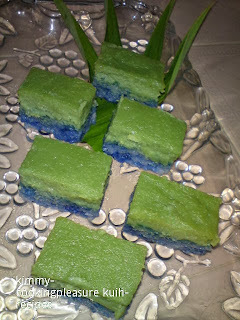 If you don't have the indigo colour, it is alright to make it plain. In fact, I shouldn't have mix the blue and plain colour rice together, then I would have a more distinct tri-colour kuih [white, blue and green]. Not too difficult to prepare yet the kuih is good and definitely worth the to make for the family and friends. My friends told me this kuih is good. 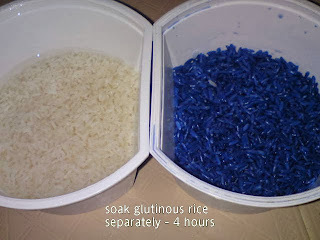 Drain rice and combine the rest of ingredients. Place in a steaming tray and steam for 40 minutes until rice is cooked. Cool for a while and discard the pandan leaves. 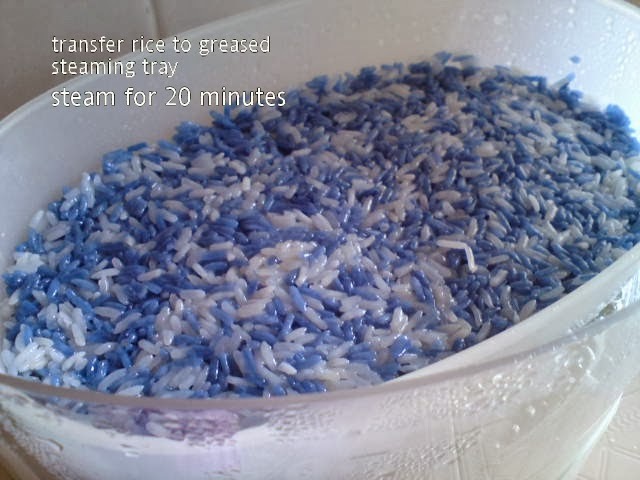 Transfer rice to a lightly greased steaming tray. Press rice gently to level out. Steam for 10 minutes over high heat. 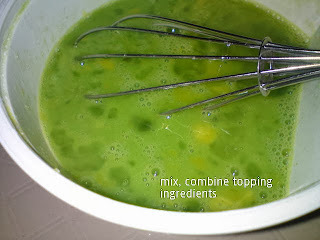 Mix all the topping ingredients well. Strain into a double boiler with boiling water. 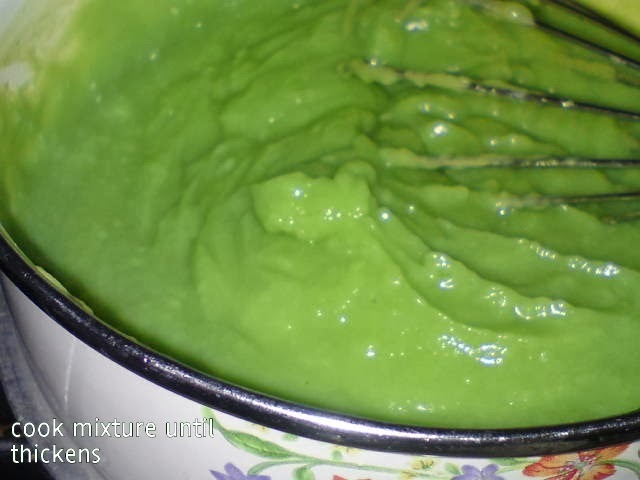 Stir mixture until it thickens. Pour mixture over the steamed rice and continue to steam for another 25 minutes over low heat. Cool thoroughly [several hours] before slicing.